In July 1976, an Air France flight from Tel-Aviv to Paris was hijacked and forced to land in Entebbe, Uganda, over 2,000 miles from its destination. The 248 passengers were then separated and held hostage with the hijackers and Ugandan Special Forces threatening to execute them unless their terrorist comrades were released. With the clock ticking and after much debate, an elite commando unit was dispatched to carry out Operation Thunderbolt - the most daring raid and rescue mission ever attempted. 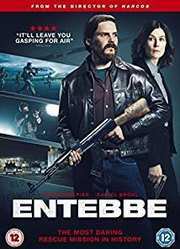 Starring Academy-Award Nominees Rosamund Pike and Daniel Bruhl and Directed by acclaimed Narcos Director Jose Padilha.